This product is no longer available and has been replaced by: ST-21. The SAT ARGOS was a Service Argos-certified Platform Transmitter Terminal (PTT) that supported four ID codes. Data could be delivered from Service Argos to your base station computer via Telnet, e-mail, or the Internet. For time-sensitive applications, data were available from Service Argos at times ranging from 20 minutes to four hours after successful reception by a satellite. Maximum bytes per transmission were 32 (16 low-resolution data points). 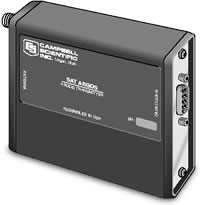 Instruction 125 needs to be included in the data logger's operating system (OS). A CD-ROM that contained the latest data logger OS was originally shipped with the SAT ARGOS PTT. Forthcoming developments in the Operating Systems can be downloaded from our website or are available for purchase on CD-ROM.